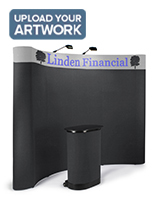 This 8' wide, curved pop up booth offers an easy, customizable solution to your convention and trade show display needs. 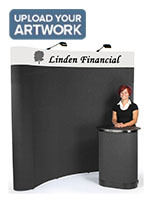 The neutral color and simple design is perfect for use as a backdrop at a convention, job fair or other public event. 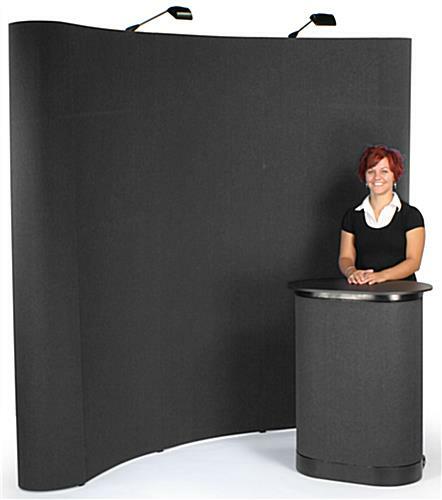 Covered with black, hook and loop receptive fabric, this pop up booth allows exhibitors to arrange any combination of accessories that is needed. Display acrylic literature holders filled with informational brochures, magazine holders with catalogs, or sign frames to capture the attention of show attendees. 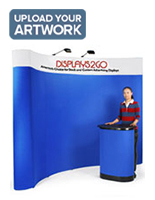 Since tradeshows typically involve travel and quick set ups, this hook-and-loop pop up booth can be set up in minutes, no tools required. 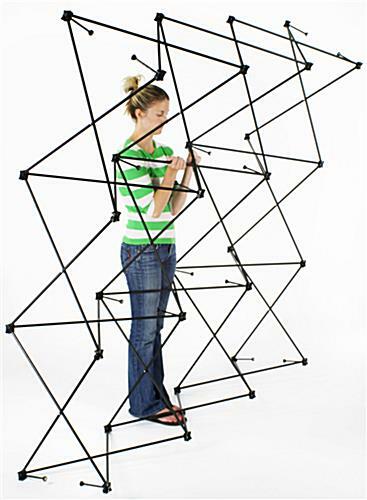 Simply raise the lightweight frame from the ground and magnetic connectors will automatically snap the pieces into place. 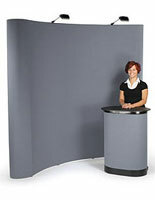 The pop up booth features magnetic channel bars that are used to connect the fabric panels. There are 3 panels and 2 end caps that attach to the frame for a seamless finish. 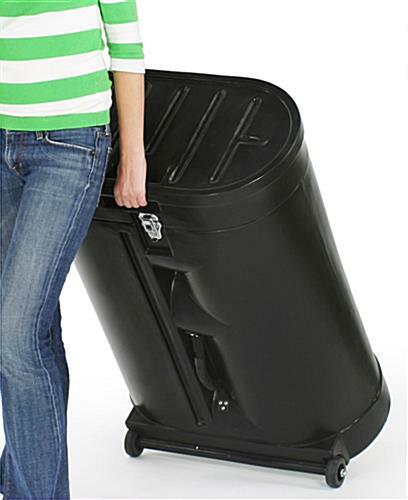 Included with this pop up booth is a molded, hard plastic carrying case that features roller wheels and safety locks. As an added bonus, this high quality travel case converts into an attractive and useful exhibit counter that can serve a number of functions. 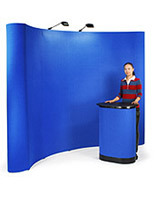 Use the counter included with this pop up booth, as a place to address the audience, display literature, or demonstrate products. 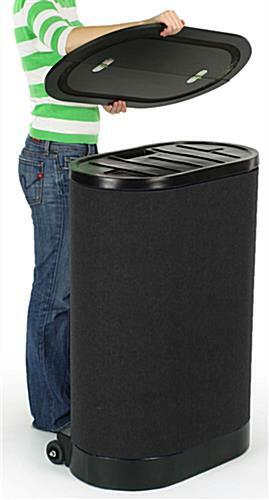 A black wrap-around panel and laminate countertop are included as part of the conversion kit. 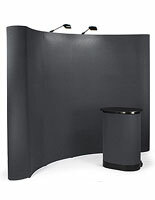 We sell this pop up booth with two halogen spotlights to give your display added exposure at your next event. 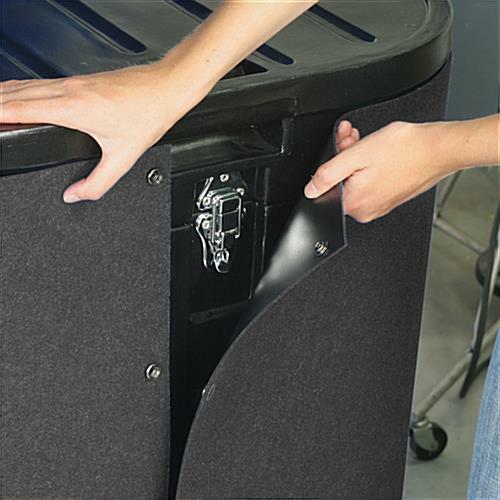 A foam-padded compartment in the case keeps them from breaking during transportation and storage. 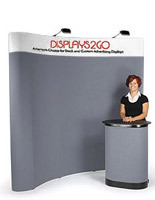 This pop up booth is a quality exhibit that will last for many years of use, and at these prices exhibitors won't find a better deal anywhere online! 96.0" x 91.0" x 17.0"